The central office (CO), also known as the point of presence (POP), houses the service provider equipment. The toll network contains communication equipment that is used to span the WAN provider network. The customer premises equipment (CPE) and data terminal equipment (DTE) are commonly located at the customer site. The demarcation point delineates where the ISP equipment and wiring ends and the customer responsibility begins. The demarcation point is located inside the customer building. The setting up of a dedicated circuit through the service provider network between each pair of communicating nodes, and fewer delays in the data communications processes are advantages of circuit-switched networks. ISDN and PSTN are the most common circuit-switched technologies. Circuit-switched networks form a dedicated circuit or channel before communication occurs. A packet-switched private infrastructure like Frame Relay is a lower cost alternative to expensive leased lines. ATM cells always have a fixed length of 53 bytes. The ATM cell contains a 5-byte ATM header followed by 48 bytes of ATM payload. WiMax towers are capable of connection to other WiMax towers by means of line-of-sight microwave links or they can provide cellular access to devices. Municipal Wi-Fi satellite technology and mobile broadband do not provide long distance point-to-point technology while providing mobile device access. Both DSL and cable connections can provide relative high speed Internet connections with reasonable cost. Whereas DSL subscribers establish individual links to the service provider, local cable service subscribers (in the neighborhood) share the same cable bandwidth. As more users join the cable service, available bandwidth may be below the expected rate. Both leased line and ISDN connections are dedicated links from the customer to the service provider, but they are more expensive than either DSL or cable services. On a Cisco router the version of HDLC used is proprietary. 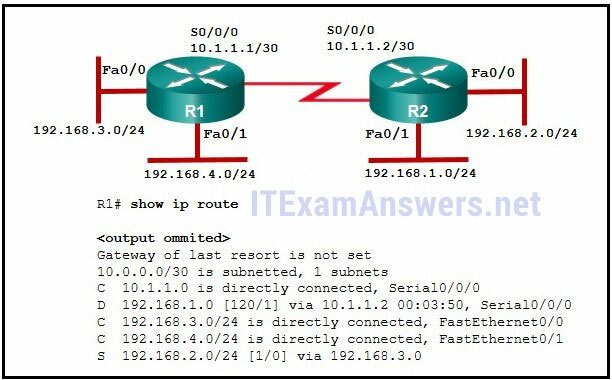 Therefore, with a link between a Cisco and a non-Cisco router, PPP should be used. Of the two authentication types that PPP supports (PAP and CHAP), CHAP is more secure. PPP multilink spreads traffic across bundled physical WAN links. To configure PPP multilink on a router, creating the multilink bundle begins with creation of the multilink interface. The serial interfaces are the WAN links in the exhibit and must be assigned to the multilink bundle. The serial interfaces must also be enabled for PPP encapsulation to become part of the multilink group. The secret password configured on each router must be the same for successful CHAP authentication. A different hostname is expected to be configured on each router, and the username configured on each router must match the hostname of the other router for successful CHAP authentication. The DCE interface clock rate is configured because communication across the link is successful when CHAP is not configured. Another difference between PAP and CHAP is that CHAP sends periodic challenges whereas PAP only authenticates one time. LCP (Link Control Protocol) is a component of PPP. ADSL provides higher downstream bandwidth to the user than upload bandwidth. SDSL provides the same capacity in both directions. TDMA and CDMA are not DSL technologies. PPPoE, Point-to-Point Protocol over Ethernet, creates a tunnel through the DSL connection for the purpose of transmitting serial data up and down a wide frequency band and allows multiple subscribers connected to the network to transmit and receive concurrently. Software defined networking (SDN) is a network architecture developed to virtualize the network. SDN moves the control plane from each network device to a central network controller. The SDN controller uses northbound APIs to communicate with the upstream applications. It also uses southbound APIs to define the behavior of the downstream virtual switches and routers. 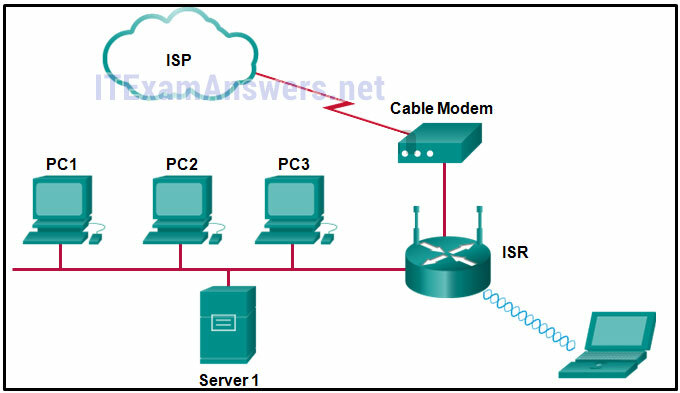 Application Network Profile (ANP) – An ANP is a collection of end-point groups (EPG), their connections, and the policies that define those connections. Application Policy Infrastructure Controller (APIC) – APIC is a centralized software controller that manages and operates a scalable ACI clustered fabric. Cisco Nexus 9000 Series switches – Provides an application-aware switching fabric and works with an APIC to manage the virtual and physical network infrastructure. OpenFlow enabled switches are required in SDN implementation. Both Interface to the Routing System (I2RS) and Transparent Interconnection of Lots of Links (TRILL) are different approaches developed for network virtualization. The site-to-site VPN is an extension of a classic WAN network that provides a static interconnection of entire networks. Frame Relay would be a better choice than leased lines, but would be more expensive than implementing site-to-site VPNs. The other options refer to remote access VPNs which are better suited for connecting users to the corporate network versus interconnecting two or more networks. A site-to-site VPN is established with a GRE tunnel. It does not link two LANs, but rather it extends the reach of a single LAN across a WAN. Tunnel interfaces are configured on routers at each end of the VPN, not in the intermediate routers. The IP address of the tunnel interface on B-Gateway is incorrect. It should be in the 172.16.1.0/24 network. Changing this address will bring up the tunnel interfaces and allow the hosts to ping each other. Exterior routing protocols exchange routing information between autonomous systems. BGP is the only exterior routing protocol in use today on the Internet. The graphic shows four autonomous systems (AS). AS 65002 is connected to AS 65003 and to AS 65004. AS 65003 is connected only to AS 65002. AS 65004 is connected to AS 65002 and AS 65005. AS 65005 is connected to AS 65003 and to the Internet.Refer to the exhibit. For which autonomous system would running BGP not be appropriate? It is appropriate to use BGP when an autonomous system is multihomed, or has more than one connection to another autonomous system or to the Internet. BGP is not appropriate for single-homed autonomous systems. Autonomous system 65003 is a single-homed AS because it is only connected to one other autonomous system, 65002. The lt and gt keywords are used for defining a range of port numbers that are less than a particular port number or greater than a particular port number. All IPv6 ACLs automatically include two implicit permit statements; permit icmp any any nd-ns and permit icmp any any nd-na. These statements allow the router interface to perform neighbor discovery operations. There is also an implicit deny ipv6 any any automatically included at the very end of any IPv6 ACL that blocks all IPv6 packets not otherwise permitted. With an inbound ACL, incoming packets are processed before they are routed. With an outbound ACL, packets are first routed to the outbound interface, then they are processed. Thus processing inbound is more efficient from the router perspective. The structure, filtering methods, and limitations (on an interface, only one inbound and one outbound ACL can be configured) are the same for both types of ACLs. DCHP starvation attacks are launched by an attacker with the intent to create a DoS for DHCP clients. To accomplish this goal, the attacker uses a tool that sends many DHCPDISCOVER messages to lease the entire pool of available IP addresses, thus denying them to legitimate hosts. Port security cannot be enabled on a trunk and trunks are the only types of ports that have a native VLAN. Even though turning DTP off on a trunk is a best practice, it does not have anything to do with native VLAN risks. To prevent security breaches that take advantage of the native VLAN, place the native VLAN in an unused VLAN other than VLAN 1. The management VLAN should also be an unused VLAN that is different from the native VLAN and something other than VLAN 1. SNMP can be used to collect and store information about a device. SNMP managers can periodically poll SNMP agents for information stored in the MIB of the agent. To reduce the amount of polling and thus the load on the network and the SNMP agent, traps can be set on the agent that send information to the manager without the need for polling. The Switched Port Analyzer (SPAN) feature of Cisco switches allows traffic that is coming into or out of a switch port to be copied to a different port so that it can be collected and analyzed with network monitoring software. Without any QoS mechanisms in place, time-sensitive packets, such as voice and video, will be dropped with the same frequency as email and web browsing traffic. Voice traffic does not consume much in the way of network resources, such as bandwidth. However, it is very sensitive to delay and dropped packets. For good voice quality, the amount of latency should be less than 150 milliseconds and packet loss less than 1%. True or False. DiffServ is a QoS strategy that enforces end-to-end guarantees. Unlike IntServ which provides QoS guarantees through the use of a resource reservation mechanism, DiffServ cannot guarantee end-to-end QoS. With DiffServ, a QoS policy is applied and enforced on a hop-by-hop basis. Traffic must be classified before it can be marked. After traffic has been marked, then actions can be taken to provide a specific level of service. Traffic should be classified and marked as close to its source as possible. The trust boundary identifies at which device marked traffic should be trusted. Traffic marked on VoIP phones would be considered trusted as it moves into the enterprise network. Providing the infrastructure for application hosting and application mobility between cloud and fog computing is the function of the application enablement platform pillar. The network engineers should first establish that the reported performance of the network is in fact abnormal. This is done by referring to the documented network performance baseline.Once it has been verified that the network is not having a proper performance, then specific troubleshooting processes can be applied. The top-down troubleshooting method starts with the applications and moves down through the layers of the OSI model until the cause of the problem is identified. Using a web brwoser to test DNS resolution is a troubleshooting step at the application layer. The Cisco IOS IP Service Level Agreements (SLAs) feature is a useful tool to discover a network failure. Network administrators use IP SLAs to simulate network data and IP services to collect network performance information in real time. The results can help network administrators detect signs of network issues in the early stages. Both encapsulation and framing errors are network problems that are associated with the data link layer. Electromagnetic interference, incorrect interface clock rates, and late collisions and jabber are indications of physical layer problems. A router interface may experience Layer 2 issues such as framing problems, keepalives not received but expected, and encapsulation problems. The status of the interface that is experiencing Layer 2 problems would indicate line protocol down. One of the major differences between IPv6 and IPv4 ACLs are two implicit permit statements at the end of any IPv6 ACL. These two permit statements allow neighbor discovery operations to function on the router interface. On SW1, where VLANs are implemented, each port should be assigned to a proper VLAN. The physical interface on Branch must be activated to maintain the link status between Branch and various VLANs on SW1. In order to allow communication to remote networks, proper routing must be configured on both Branch and HQ routers.